While "arang" is charcoal and "arang batu" is coal, and very often interchangeable in usage, it is interesting to note that the combined words "arang para" in Frank Swettenham's Vocabulary of the English and Malay Languages mean "the shelf which, in all Malay houses, is placed in the smoke of the fire and on which the salt and other things which ought not to get damp are kept." (Swettenham 1887). There is no English equivalent word(s) for it. 'Arang para' itself is rarely used in the Malay language nowadays. The hill of 3,245 feet (989 metres) that is located in Kuala Kangsar district is named after this item, called Bukit Arang Para; it is in the Bubu Forest Reserve. In the topographical map, the height, however, is stated at 999 metres. Our exploration team's GPS devices seemed to record the height closer to 989 metres; perhaps we should have climbed the boulder to get a more accurate reading. There have not been too many hikes to this hill to date. The terrain appears raw. The entire track is basically muddy but with leeches innumerable. As it is seldom trekked, the trail is littered with fallen leaves. There are a couple of small streams where no one has to get their hiking shoes wet. Few sites are available as campsites due to flat surface, the rest is slopes, with some steeper but none of the stretches require all four limbs to climb up; there are a few short, gradual downslopes on the way up. 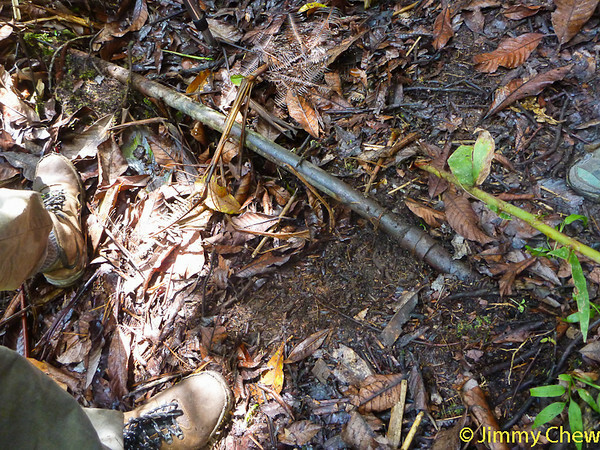 Some stretches are slippery with no trees that can provide grips, so it is recommended that one carries along the trekking pole. Overall track is not particularly challenging; there are tape markings especially from the second half of the journey onwards. For a distance of below 6 km per way, it takes about 3 plus hours at a leisurely pace to reach the summit, and less on the way back down. When one is close to reaching the peak, one may stumble upon what look like border stones (see "BAP BS01" at Fig. 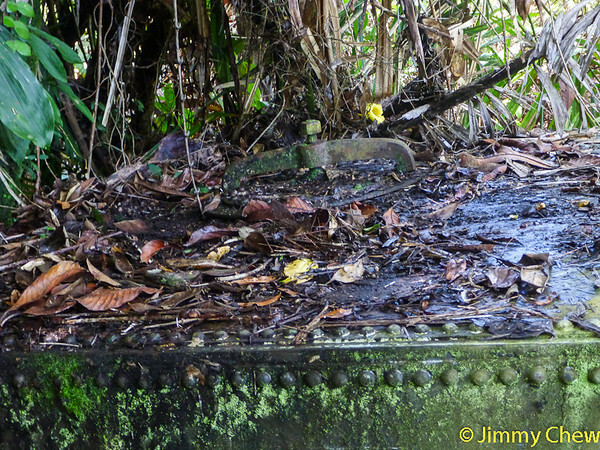 1 below) but which are not as they are really stone markers demarcating the forest reserve area. During the early years, it is noted that Arabian coffee estate was to be developed at Arang Para following the works on experimental gardens at Kuala Kangsar (Swettenham 1893). It is later reported in The Straits Times (1932) that Arang Para had been surrendered back to the jungle, and the track up the mountain is overgrown, as were the coffee estate and tea estate that once flourished on its slopes. The cultivation on Arang Para has been abandoned and even the bungalow was still in existence on the summit, and where "Hermitage" is still marked on the map, it is inhabited only by ghosts (The Straits Times 1933). More about the Hermitage at the next section. "Perak possesses some very enviable health resorts, duly appreciated and patronised by the Europeans of the State, but hardly ever visited by strangers. That is curious, for, on Gunong Ijau and Arang Para (the Hermitage), will be found a climate, little if at all inferior to that of the Riviera. The thermometer varies between 59¢XF (i.e. 15¢XC) in the early morning and about 73¢XF (i.e. 22.8¢XC) in the heat of the day, - that is in the shade of course, - quite cold enough for fires; the scenery is magnificent, the air balmy and heavy with the scent of roses and violets which, with many other flowers of temperate climes, bloom here in profusion all the year round. From June to August specially; but, also in other months, the jungle about 3,000 feet above sea level is carpeted with wild forest flowers, the harebell, anemone, and primrose of the Malay jungle, while ground and tree orchids in great quantity blossom at the same time, as well as the wonderful magnolia which grows wild in the higher altitudes of Ijau. In the dark recesses of these hill forests are silent birds of wonderful plumage, troop of monkeys are also sometimes seen, but they do not appear to appreciate the cold of these altitudes. In any open sun-lit clearing, quantities of brilliant coloured butterflies are certain to be found and if, on a still evening, a lantern be put out on the top of Ijau, immense numbers of rare moths and flying insects of all sorts will be attracted to the light" (Swettenham 1893). 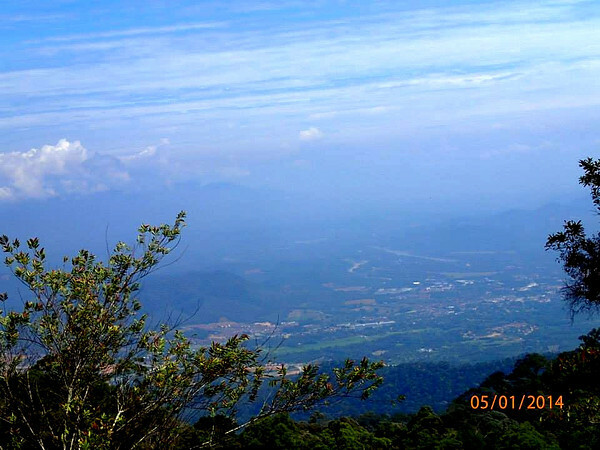 Gunong Ijau is the old name for Gunung Hijau, whose height is 1,449 meter (4,751 feet), located in Taiping, Perak. At the top of this Bukit Arang Para is the aptly named Hermitage, a bungalow built as a retreat centre for government officials. Above the rubber plantations, along the road or railway from Gunung Pondok towards Kuala Kangsar, and on the west, on a clear day, may be descried a clearing on the top of the hills in which is set the Hermitage, a house built by Government in early days and later sold when it had been decided to make a hill station above Taiping (Harrison 1919). The hill station referred to is Maxwell Hill (first known as Maxwell's Hill). Sir Hugh Low founded several gardens or experimental stations for the introduction and cultivation of economic plants. Very few records of this work but it appears that most of them were instituted in about 1875 or 1876. They comprised the Gardens of Kuala Kangsar, the Tea Gardens and Maxwell's Hill Gardens, on the Taiping Hills the Hermitage Hill Garden and Waterloo Garden, and Telok Anson. Botanic Gardens of the Malay Peninsula as far as Hermitage Hill is concerned was founded before 1880 but abolished in 1893 (Royal Botanic Gardens, Kew 1910). 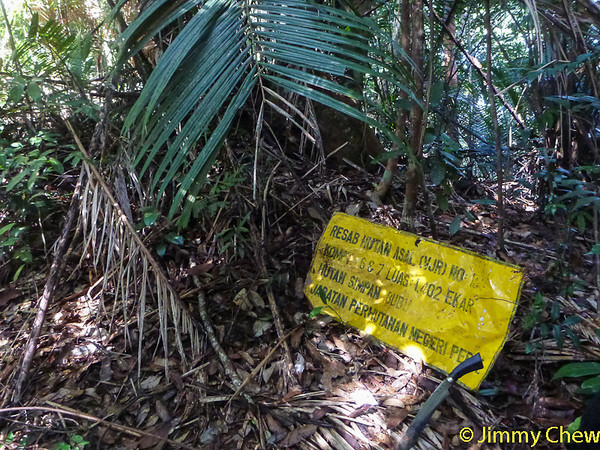 Photo 1: A recent signpost by the Perak State Forestry Dept. designating the area which is in the Bubu Forest Reserve. 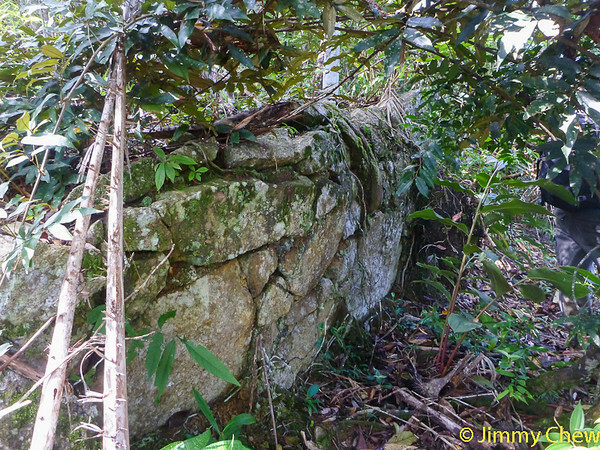 Photo 2: The remains of the Hermitage bungalow wall. Photo 3: The stairs leading into the bungalow. Photo 4: The solid water storage tank that stands firm till today with cover intact. 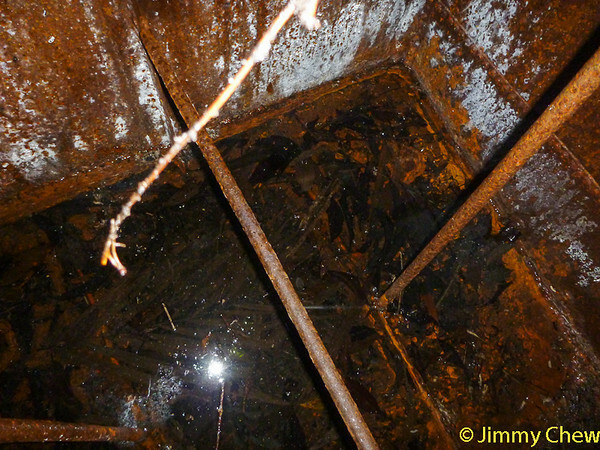 Photo 5: The water storage tank that still holds water despite the rust. 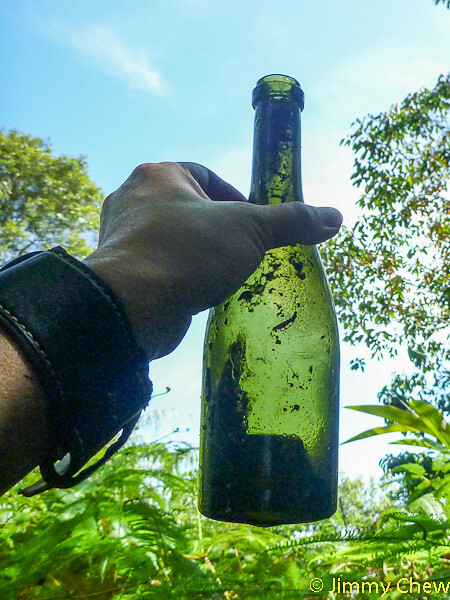 Photo 6: An old (vintage) green wine bottle with indented base (push-up or kick-up base). Photo 7: The old water pipe nearby the water storage tank appears to be still in good condition. 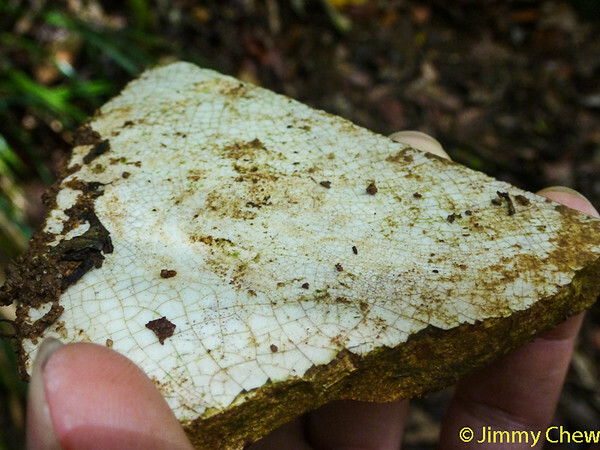 Photo 8: A piece of old tile. 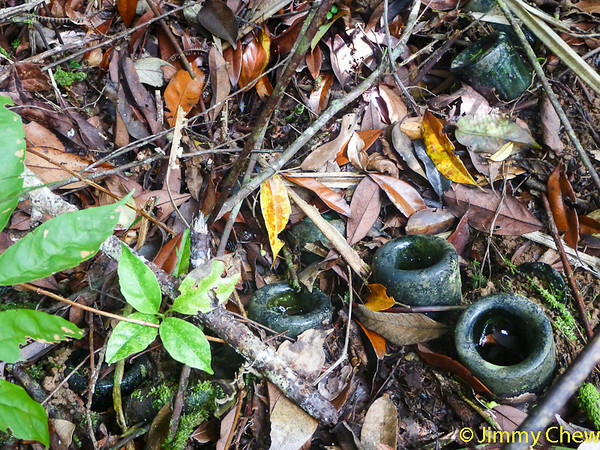 Photo 9: There are many of these old wine bottles still planted upside-down inwards into the soil at various spots at the mountain garden. 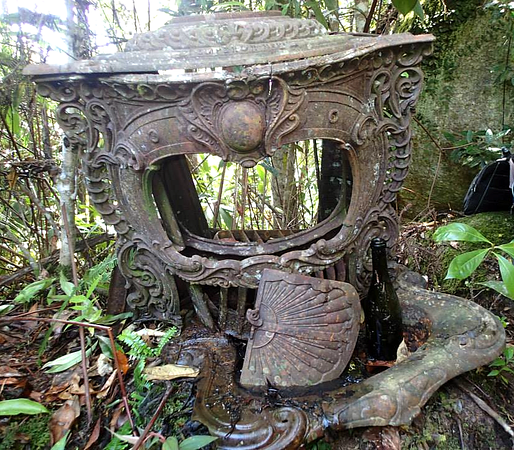 Photo 10: Remains of the old Victorian parlor stove at The Hermitage (photo credit: Basman). In Photo 10 above, the parts hinged dome piece and the detachable base were missing from the early Victorian parlor stove bearing the words "Emperor N¢X2". This unit may or may not have the primary drafts on the front side but the 'finale' (top cover, see Fig 2 below) is definitely in the possession of a lucky someone. 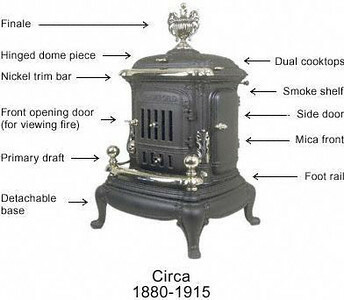 Fig 2: Parlor Stove glossary for interest and knowledge (source: http://antiquestoves.net/dir/parlor-stoves). The Hermitage didn't live to see the day as Maxwell Hill was the preferred hill to be designated as a hill station. Bailey, an Assistant Engineer based in Kuala Kangsar describes The Hermitage, already in ruins, as "Over to the west and the forest-clad hills with a ruined Istana called The Hermitage, the sky was pale turquoise, and as one turned further west the colour deepened until the sky was pure ultramarine, whilst thin stray wisps of cloud gleamed and shone with silver, pink and gold as they moved slowly like fairy feathers across the setting sun" (Bailey 1996). Barlow (1988) in Shahir, Ahmad & Shaari (n.d.) suggested that it is easy to imagine Swettenham during this period with his increasingly unhappy marriage, seek considerable relaxation in his drawings. Especially those made particularly on the occasions when he took a few days off from Kuala Kangsar or Taiping, up the hills to the cooler climate of "The Hermitage" on Gunong Arang Para or at "The Cottage" above Taiping. Swettenham's drawings and watercolors general focuses on the landscape, also riverscape and seascape during his travels in Malaya. 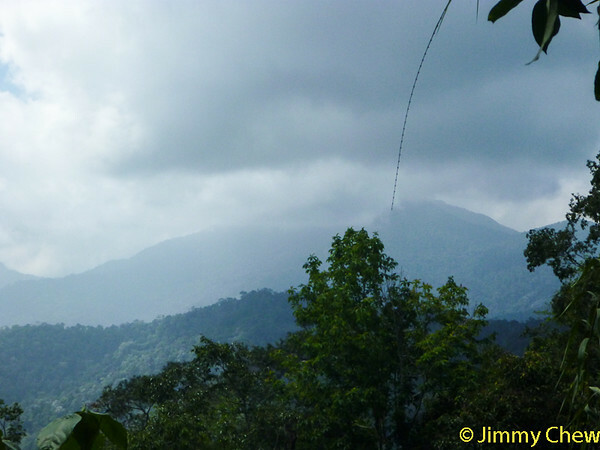 Photo 11: View of Gunung Bubu from Bukit Arang Para (@ 2014). The pinnacle is obscured by clouds. Gunung Bubu is located at a bearing of 234¢X (W.S.W.) from Arang Para. It is a popular mountain suitable for 2D1N camping as well as day trips; the trailhead is accessible via Hutan Lipur Ulu Kenas, also located at Kuala Kangsar, Perak. It is possible to climb Gunung Bubu via Arang Para, albeit a longer distance compared to using Ulu Kenas route. 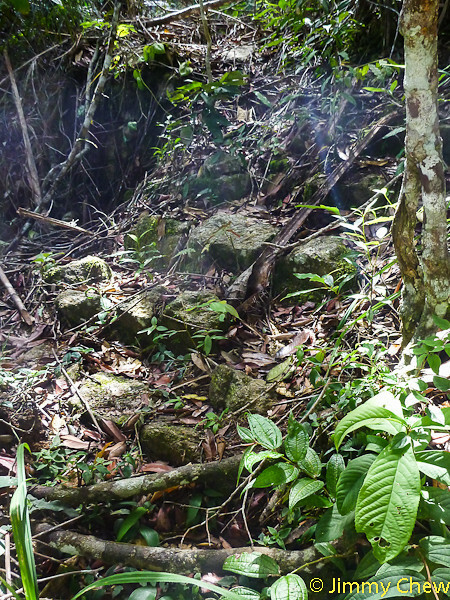 In fact, the first climb to Gunung Bubu via Bukit Arang Para is believed to have been taken place in 1884. 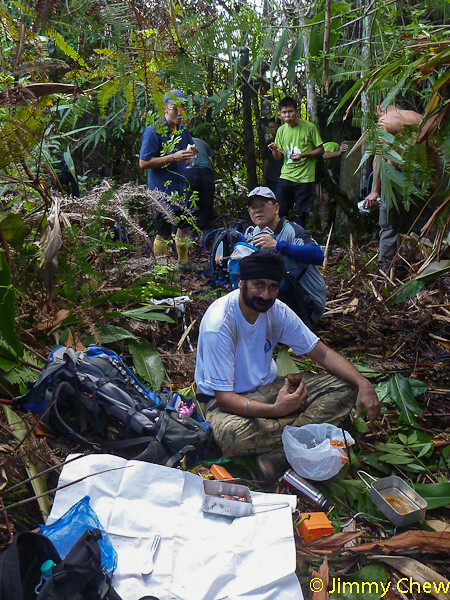 Tenison-Woods quoted there was no record of any exploration of Gunung Bubu till the peak, at most were the adjacent and lower summits. Tenison described the climb beginning from the mountain garden at Arang Para was not a good point of departure as they had to descend and ascend very steep spurs before reaching the foot of the range leading to Bubu (Tenison-Woods 1884). The trail leading out westwards from The Hermitage's mountain garden is located at the South-side where rock boulders are aplenty. 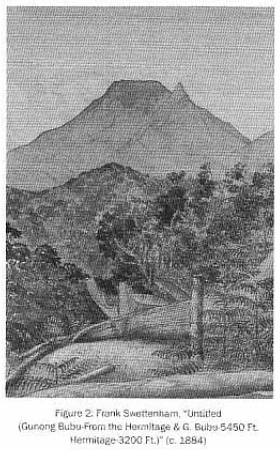 In the same journal, Tenison-Woods and team took four days to reach the summit of Gunung Bubu, with the last day being a hasty, trial trip (or recce trip in modern day usage); the Arang Para bungalow was visible at course E.N.E. but Larut view is blocked by the spurs of Gunung Bubu. The article 'Journey to the Summit of Gunong Bubu' by Tenison-Woods makes a very interesting reading as it elaborates the adventure into precise details including day-by-day trekking, the suffering of his team, the weather conditions, and the terrains and views encountered. Nowadays the term 'Meru Range' is no longer used. This range is not listed in list of 18 physical mountain ranges (in both East and West Malaysia) some of which are famous ranges like Titiwangsa, Crocker, Tahan, Benom and Bintang. However, the name 'Meru' has been adopted in estates and developments throughout the years to recent times e.g.. Bandar Meru Raya, Taman Meru, Meru Valley Golf & Country Club which are located in the vicinity of Ipoh town. Just where is Meru Range? Looking East, on a clear sky, Meru Range is visible from The Hermitage. 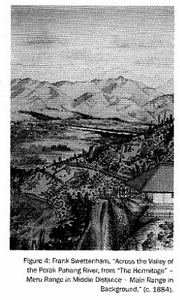 Meru Range is depicted in Swettenham's drawing separating Sungai Perak from Kinta Valley; and with the main range at the background (Shahir, Ahmad & Shaari (n.d.)) The main range described refers to the Banjaran Titiwangsa. Swettenham initiated a project in 1884 to build a road, first appearing no more than a bridle path at first, across and over Meru Range at 'Kinta Pass', over a height of 1,300 feet (Khoo & Lubis 2005). Perhaps another better way to look at Meru Range is this: For those who drives up and down the North South Expressway, say, from KL to Penang, after passing Ipoh town via the expressway bypassing the toll, one will ascend the hill and later pass through a tunnel i.e. the 800 metre long Menora tunnel, and thereafter descend. That hill is the Meru Range Swettenham drew with the Banjaran Titiwangsa at the background. 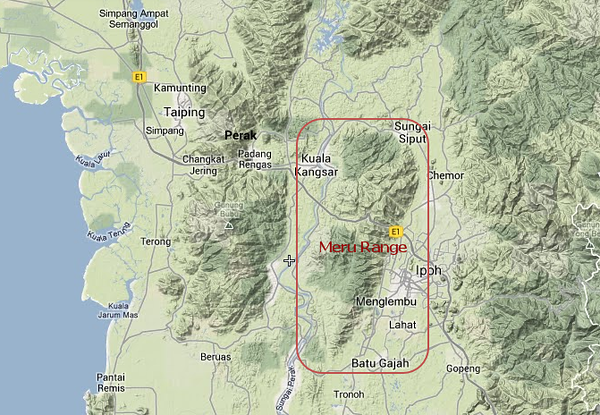 Meru Range roughly spans from Sungai Siput in the North side and Batu Gajah at the South side (see Fig. 5 below). Though not excessively researched, online resources are abundant enough to provide a good dose of write-up for Bukit Arang Para; just like Treacher's Hill (Bukit Kutu) whose history is little documented/compiled as a whole. For the next one who hikes up the hill, it would be good to know a little bit of its history so that they know what to look out for when looking at surroundings, from Kuala Kangsar town, along the track and at the hill top. Do keep the place clean and refrain from removing the artifacts would be the best advices for any hiker. 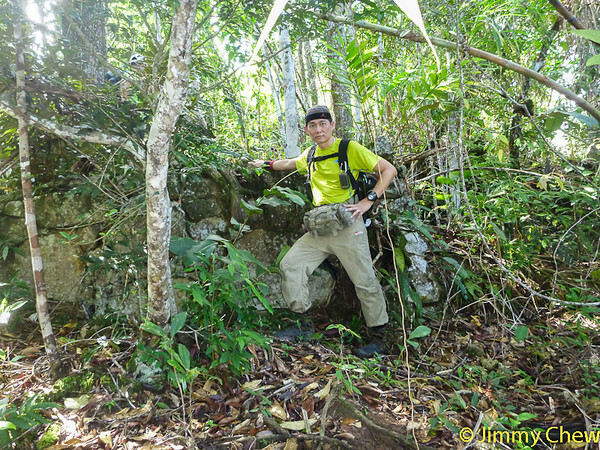 Fig 6: Me standing by the remains of front wall of The Hermitage (photo taken by Basman).